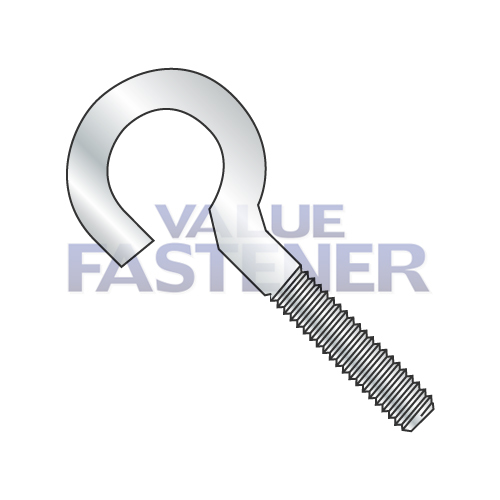 Open eye screws are an externaly threaded fastener with a unified thread pitch and a blunt point. At the end opposite the gimlet point the unthreaded section of the shank is turned into an incomplete circle leaving an opening of a specified distance through which a closed-end eye bolt or screw may pass. Applications / Advantages A convenient part that may be used as a temporary fastening in overhead applications for suspending light weights for a short period of time. One example of an end use is when a garage door assembly is installed by a single person; an open end eyw bolt, s-hook and screw eye can be used, under proper conditions, to temporarily suspend a garage door opener mechanism while the permanent suspension device is being set in place.